Here comes the second issue of Rage, written by Eric Peyron, with art & cover by Alex Nascimento, and colors by Stéphane Degardin! Our usual team of idiots have been sent on a mission by Kothas, King of Arthkan. What mission? Nicodemus won’t tell them yet, but you can be sure their trip will be anything but quiet! 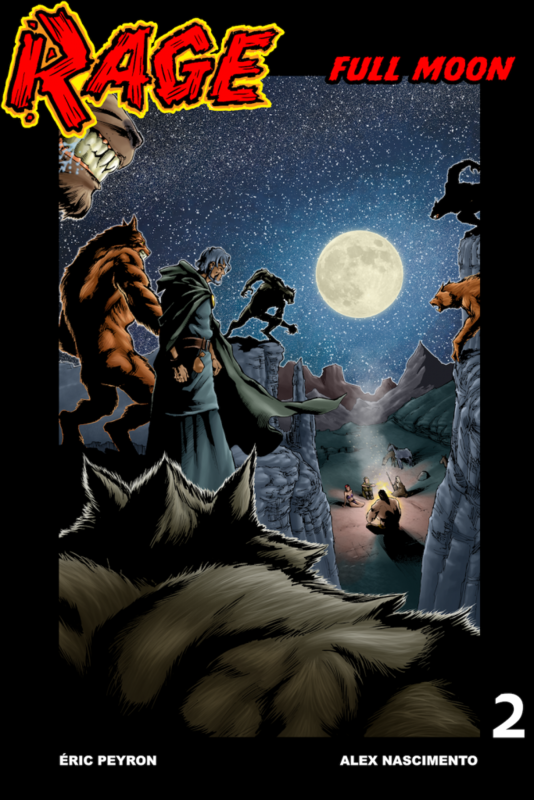 Be there as we begin a multi-part action-packed saga, featuring werewolves! A lot of werewolves! This issue has been sent to select digital publishers only. See the Rage #1 entry for the reason why. For the first two Rage Books, I also used to create a press release, and send it to every comic book website or magazine I knew, along with each book to review. To no avail. Almost no one cared to write about the Rage Graphic Novel nor Rage #1, in good or bad. And it’s not because they don’t like the books. These days, when you don’t like something, you tend to write about it in your blog, give the article a sensationalistic title, and create posts in social networks with a link to the article. Then people click the link, which increases your potential for earning money… because what you didn’t like was Star Wars 9, the “Hail Hydra” version of Captain America, Batman vs Superman or other high profile controversial products. You might even have connected to this page by mistake, because these keywords appeared in a search result… With this new face of journalism, press releases from little publishers seem pretty useless. So, no press release for this book. Sales are a little better these days, so I do know more and more people are buying Rage, promotion or not. I will have to let things build from there. The Amazon button above will lead you to this issue’s Page at Amazon UK, but if you don’t live in the UK, you can order it at the Amazon Store of most countries. Here are the links so far: Amazon AU, Amazon BR, Amazon CA, Amazon DE, Amazon ES, Amazon FR, Amazon IN, Amazon IT, Amazon JP, Amazon MX, Amazon NL, Amazon UK, Amazon US.